Home prices have sunk to 2002 levels, effectively wiping out almost a decade’s worth of home equity across the U.S. and imperiling the fragile economic recovery as Americans confront the falling value of their biggest investment. A closely watched home-price index released Tuesday, the S&P/Case-Shiller National Index, showed that prices nationwide fell 4.2% in the first quarter after declining 3.6% in the fourth quarter of 2010. The index had seen increases in 2009 and early 2010.”Home prices continue on their downward spiral with no relief in sight,” said David M. Blitzer, chairman of S&P’s index committee. The report signals “a double dip in home prices across much of the nation,” he said. That doesn’t bode well for the economy, which historically has depended on home buying and other consumer spending to rebound. Falling prices hurt economic growth in a number of ways. Not only do homebuyers curb spending when their homes are losing value, but continued price erosion keeps families stuck in homes they can’t sell because they are worth less than what they owe. Home prices in big metro areas have sunk to their lowest since 2002, the Standard & Poor’s/Case-Shiller 20-city monthly index showed Tuesday. 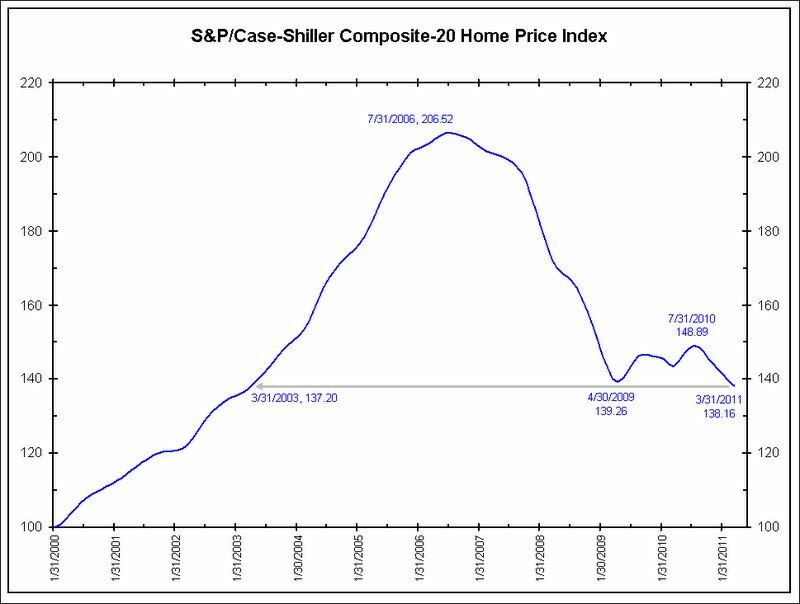 Since the bubble burst in 2006, prices have fallen more than they did during the Great Depression. The index, which covers metro areas that include about 70 percent of U.S. households, is updated every quarter and provides a three-month average. The March data is the latest available. Foreclosures have forced prices down so much that some middle-class neighborhoods have turned into lower-income areas within months. Prices are expected to keep falling until the glut of foreclosures for sale is reduced, companies start hiring in greater force, banks ease lending rules and more people think it makes sense again to buy a house. In some markets, that could take years. The latest report points to a “double dip in home prices across much of the nation,” said David Blitzer, chairman of the Index Committee at Standard & Poor’s. The chart above shows the Case/Shiller Index is at its lowest level since 2003, not its lowest level since 2002 as noted above. Either way, house prices are extremely depressed. Why is housing still so weak? Many households can’t move because they owe more than their homes are worth. Even households that aren’t underwater have seen such a big loss of wealth that they may be unwilling to sell at current prices. Credit also remains tight. While mortgage rates are low, borrowers that don’t have perfect credit and that can’t make a 20% down payment often aren’t going to qualify for the lowest rates. Insurance premiums on loans backed by the Federal Housing Administration, which allows down payments as low as 3.5%, have risen twice in the last year. And banks are scrutinizing borrowers’ incomes and tax returns, looking for any possible red flag. Many buyers aren’t willing to buy unless sellers give a decent discount—call it insurance against future price declines. Sellers already think they’re giving away the store, and may balk at further price cuts. Against this backdrop of anemic demand, the supply of homes is high as banks push more foreclosed properties onto the market. Banks are less reluctant to cut prices to unload homes quickly than traditional sellers, and because those homes sometimes require more work, they tend to sell for less. Many of those homes are being sold at discounts to investors that are willing to make all-cash bids, which can reduce the appraised value of all homes in that neighborhood. Many stories are noting that the current housing decline is greater than the decline of the Great Depression. This comes from the Case/Shiller Annual Index which goes back to 1890. 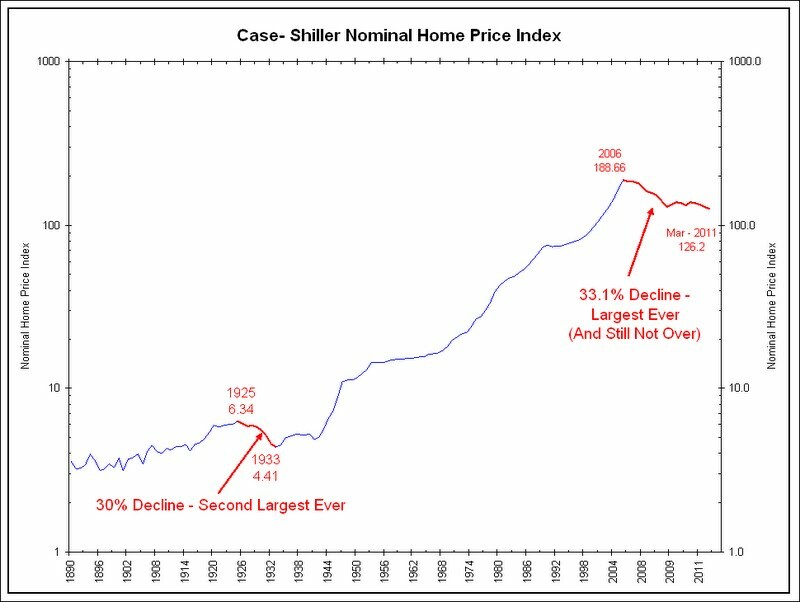 Case/Shiller used the Grebler-Blank-Winnick data from 1890 to 1947 (explanation, data). 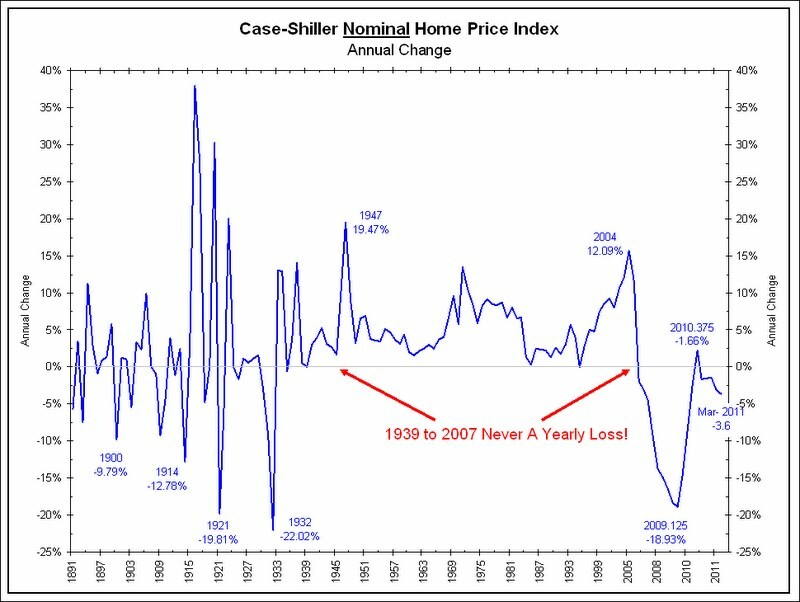 This data shows home prices fell 30% during the Great Depression (1925 to 1933) and the median price of a Washington DC home fell 27% over the same period. So, while Barry Ritholtz’s Big Picture post below is conceptually correct to point out that every other price index fell 75% to 90% during the Great Depression, Grebler-Blank-Winnick’s housing data from that period does not show house prices fell to quite that extent. Home-ownership levels were much lower during the Great Depression. In 2006 ownership levels peaked around 70%. In the 1930s they were never above 50% (data). More homes were owned outright (no mortgage) in the 1930s versus today. The typical mortgage in the 1930s required a 50% down payment and carried a 5-year term. The percentage of homes owned outright in the 1930s was much higher than it is today (source). Given the two points above, there were fewer forced liquidations in the 1930s compared to today. Underwater mortgages were a rare event, not the common event that they are today. In other words, housing was a source of strength during the Great Depression while it is the weak link dragging down the economy during the Great Recession and its aftermath. The Big Picture (Blog) – Barry Ritholtz: Is Residential Real Estate Worse than During Depression? Both the Housing markets and available financing were widely different, then versus now. In addition to the lower Home ownership levels (66.2% vs 47.8%), it was more concentrated among the wealthy as opposed to broad-based ownership now. Many more people lived on family farms early in the 20th century (than today). And, more homes were owned outright (no mortgage) in the 1930s versus today. I have to track down the data, but I recall it was over 70% in the 1920s with no mortgage versus about 40% today. But the biggest and most important difference was financing: Mortgages were 3 to 5 year, interest only, with a balloon payment of the amount borrowed at the end. After that 3 year period, you either resigned with the bank, or sold the land and paid off the note. There was no such thing as a 30 year fixed rate mortgage in the 1920s or ’30s. THAT would have had a huge impact on prices. Banks were failing by the 1000s; even someone with the means to roll their mortgage over might have foudn the bank did not have the ability to do so. With few buyers and almost no credit, the odds favor that RE prices would fall quite substantially. How much? One study of Manhattan (Estate Prices During the Roaring Twenties and the Great Depression) that looked at market-based transactions home prices between 1920 and 1939 found that Home prices plummeted 67% during the great depression. Yes, home prices are bad. They are nearing the 35% drop we forecast back in 2005. But worse than the Great Depression? I don’t think so . . .